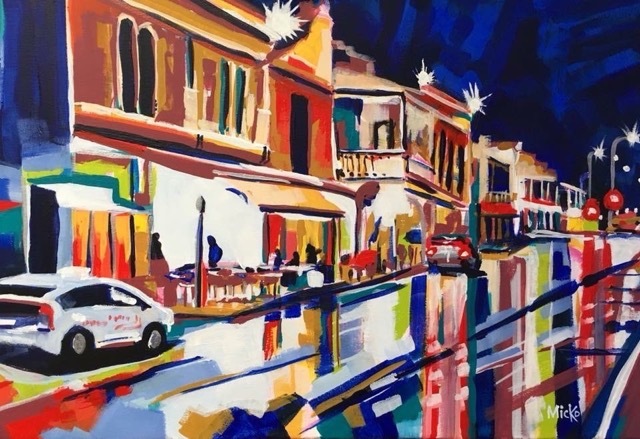 Image: “Adelaide Nightscape” By Mike White to be featured in the RQAS Modernism Exhibition Opening on Wednesday 8th August 7pm. We often say now that life moves fast, our world is ever-changing from fashion trends to technology and industry and it can be hard to keep up. If you have ever wondered when western society started to put the pedal to the metal it can traced back to the age of modernity. Following the period of enlightenment in the early 19th century, the age of modernity began and with it the innovations of industry and technology that have lead us to today. In the art world Modernism as a movement can be traced back to 1860s. The movement began with Manet and proto-impressionism and culminated in Abstract Expressionism and Jackson Pollack’s drip paintings of the 1950s. In a way this timeline can be seen as a gradual flattening of the picture plane and reduction of subject matter. In Clement Greenberg’s famous words “Realistic, naturalistic art had disassembled the medium, using art to conceal art; Modernism used art to call attention to art.” In essence by the time Jackson Pollack was pouring and flicking his brush on larger than life canvas, paintings were no longer of people or places, paintings were of paint. To understand that progression we must take a step back to the first Modernist painters – Manet and his school of impressionists. These artists rejected mimesis and the idea of the painting as a window into another world, the techniques they used evolved and became painterly. They played with perspective rendering the picture plane illogical. But that was not all, for the first time in art instead of subject matter drawn from mighty Greek mythology or religious rhetoric, they pursued subjects of modern life; the Flaneur on the streets, the gentlemen and ladies strolling in the public gardens or the underbelly of the Parisian nightclub scenes. Their choices in style, technique and subject matter revolutionised the art world and the term “Impressionists” initially coined by a journalist and intended as an insult now reminds us of the subtle beauty of the Monet’s Lilies, or the muted melancholy of Degas’s Absinthe Drinker. And thus Modernism began with a bang disrupting centuries old traditions and much like the locomotive of the same vintage took off going faster and further than anyone could have predicted. Impressionism was followed by post-impressionism, Art Nouveau, Symbolism, Fauvism, Cubism, Futurism, Constructivism, Dadaism, The Avant Garde, Surrealism, De Stijl, Colour Field Painting and Abstract Expressionism. With the same velocity the world changed and evolved giving way to new technologies and industries. From industrialism to electricity to photography, film and automobiles, aeroplanes and radio, it really was a time of rapid change and with this change shifts to societal perception, attitudes and art. Modernism is without a doubt one of the fastest shifting and most influential periods of art history and yet each movement contained with the kaleidoscopic sphere of Modernism though fast was not fleeting, the mass appeal of Impressionism, Cubism or Surrealism continues to thrive finding a new audience with each generation of art lovers. The RQAS’s Petrie Terrace Gallery is holding its first Modernism Exhibition opening on Wednesday 8th August 7pm. Come along and meet the artists and discuss why this period of art is still so captivating today. This entry was posted in Latest News, RQAS News and tagged art, art history, artist, gallery on 26 July 2018 by Rochelle.